Growing up on the south side of Chicago in a poor, black, working-class neighborhood, Delon Hampton realized early on that any success he would achieve in life, he had to create on his own. Having earned a place at college, he decided to focus on civil engineering. 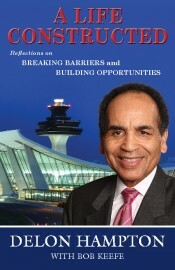 After completing his graduate and PhD studies at Purdue University, Hampton entered a career that was not always welcoming to an African American—first as an academic and then, in 1973, as the founder of Delon Hampton & Associates (DHA), an engineering consulting firm based in Washington, DC. Over the last forty years, DHA has risen to become one of America’s leading civil engineering practices, particularly known for its award-winning work on transportation and infrastructure projects such as Dulles and Reagan National airports in DC, and the Atlanta and Los Angeles metro systems. Through his personal example and his leadership of professional organizations such as the American Society of Civil Engineers, Hampton has campaigned for equal opportunity. He has been outspoken in his belief that the leadership of engineering firms and professional organizations need to better embrace diversity, in deeds as well as words. In his philanthropy, he has supported institutions that have demonstrated their commitment to a level playing field, and he has mentored and encouraged minority businesspeople. This book shares a rich vision for a more equitable workplace and necessary change in the disciplines of engineering. It is also an inspiring story of how through hard work, determination, and strong relationships, a young boy from the wrong side of the tracks could still achieve the American dream. Delon Hampton is the founder, president, and CEO of Delon Hampton & Associates, an award-winning, top ENR 500 Design and top 100 Program and Construction Management firm that employs over 100 people in offices in Atlanta, Los Angeles, and Washington, DC. Hampton has been recognized throughout the engineering industry for his notable accomplishments as an honorary member of the American Society of Civil Engineers, a former councilor of the National Academy of Engineering, a fellow of the American Academy of Arts and Sciences, and as a recipient of the Edmund Friedman Professional Recognition Award and the James Laurie Prize, both given by the American Society of Civil Engineers. Hampton earned his PhD and master of science in civil engineering from Purdue University, and his bachelor of science in civil engineering from the University of Illinois. Bob Keefe has been a writer, editor, and journalist for more than twenty years, most recently as the Washington correspondent for the Atlanta Journal-Constitution newspaper.